Our modernly furnished spacious villa is fully equipped with anything you might need and it's suitable for a romantic honeymoon, or for large groups and families. Get ready for a relaxing stay and pamper yourself with a great view by the jacuzzi or by the private infinity pool. Every day early in the morning our gardener cleans the pool, trims the garden and leaves some fresh loaves of bread on your door. Located on top of a hill, Kalkan Downtown is just 500 meters away by foot or by car, whilst the sea is just 100 meters away (bird's eye view). Take a break and enjoy the good scenery in a relaxing and comfortable 375 m2 wide villa. The villa is surrounded by a huge garden, on top of a hill. There is no other house on top of you and there is a divider between the villa on the right so that your privacy belongs only to you. 2 bottles of beers, milk, fruit juice, 6-8 eggs, butter, jam, olives, cheeses, bread, chocolate, tomatoes, cucumbers, fruits, 5 litre bottle water, and the essentials such as: tea, coffee, filter coffee, salt & pepper, sugar and olive oil are all provided. From the floor tiles to the kitchen counters, Kalkan Dream Villa is constructed with the top quality materials and it was carefully designed in a nature-friendly way. Total Rooms: 4 Bedrooms (2 of the rooms with en-suite bathrooms, and a jacuzzi in one of the rooms). The kitchen is fully equipped; including toaster, oven, kettle, coffee maker, blender, microwave and so on. LCD TV, WIFI, vacuum cleaner, ironing machine. The tap water is safe to drink, it's fresh from the mountains. It's suitable for families, for friends or for a honeymoon. • 3000 m2 of quiet land covered with palm, banana, olive trees. • Exceptional Mediterranean sea and islands' views from every corner of the villa. • Ultimate feeling of exclusivity. • Our principle has always been to use natural materials throughout the construction and maintaining. SERVICE INCLUDED IN THE RENTAL RATE: The terraces and the pool are cleaned each morning. The plants are occasionally watered in the early evening. Electricity, water, gas, Wi-Fi are included. We usually deliver fresh bread and bottled water for you but please let us know if you are not interested in these services (or in part of them). Daily Maid Service: For 30 GBP per day, we offer you daily maid or nanny service. Transfer from/to the airport Daily Maid Service: We can pre-arrange the transfer. Car Rental: We can arrange the rental on behalf of you. Every day early in the morning, our gardener cleans the pool, trims the garden and leaves some fresh loaves of bread on your door. Cleaning service is provided twice a week. A totally secluded and an exclusive stay. The kitchen is fully equipped; including toaster, oven, kettle, coffee maker, blender, microwave and so on. This was a beautiful home that had everything you could want. The location also gave you the best view of Kalkan. And Seren was a perfect host and was very responsive to all my questions, even when I asked about medical care options. We will try and stay here again. The pictures do not do this property justice! Our party of 9 thoroughly enjoyed every minute of our stay and really didn't want to leave. We utilized all three floors of the spacious and well adorned home. There was ample common area for us to spend time together as well as enough space for everyone to spend private time. The views from every location are breath taking. The outdoor space is absolutely amazing! From breakfast on the porch to swimming in the infinity pool to dinners on the pool deck to laying out in the sun all day... all with the most beautiful views in Turkey! The amenities of Kalkan city were great as well. We enjoyed all of our restaurant experiences and shopping too. The hosting and support are world class. We were greeted with a nice welcome package. Every day thereafter, we were checked on and left with a fresh loaf of bread. Thanks to the owners and staff for making our time so enjoyable. I can honestly say that this was the best villa I have ever stayed in, combining quality accommodation and breathtaking views without sacrificing a convenient location. The Service: The villa owner was very helpful from our initial enquiry, right up until the day we left. She provided us with all the information we requested and more, as well as arranging our airport transfers. She also visited us during our stay to check if we needed anything and brought us some delicious Turkish pastries. We arrived hot and tired on a Saturday afternoon and were welcomed by the property manager who gave us a quick tour and then left us to enjoy our holiday. The welcome pack was very much appreciated and actually very comprehensive. We tended to eat light during the day then enjoy the amazing cuisine on offer in Kalkan during the evening so the food provided in the fridge more or less lasted the whole stay, complimented by the daily fresh bread delivered to the door. The Villa: The villa itself was very clean and comfortable and the air conditioning was very efficient, giving us much needed relief from the heat. The bathrooms were spotless and I loved the walk-in shower. A landline is available to make local calls which was extremely useful for calling a taxi in the evening. The kitchen is fully equipped and we never once felt that we lacked anything (including salt, pepper, sugar etc). The bedrooms were large with ensuite and the views were amazing. The only suggestion for improvement I would make here is that either blackout blinds or shutters would have been appreciated as I am quite a light sleeper and was woken up earlier than I would have liked every morning. There was also a safe set into the wall so we could lock our valuables away for peace of mind. The living area had very comfortable sofas, a TV, a computer, books and some games. The outside space: I have saved the best for last. The whole of the outside space is paved with the most beautiful marble and there are very comfortable sun loungers and mobile parasols, as well as a barbeque and dining areas. The pool, I can honestly say, is the most beautiful and cleanest I have ever witnessed at any villa I have stayed in. It was simply perfect! Watching the sun go down either from in the pool or poolside was one of the highlights for me. The smaller pool and waterfall is an added bonus and particularly useful for anyone a little afraid of water as the main pool is 1.9m deep all around. We have just had the most amazing holiday in your beautiful villa and we will definitely be back next year. Kalkan is a great holiday destination for families and the people in the town we so friendly and welcoming. 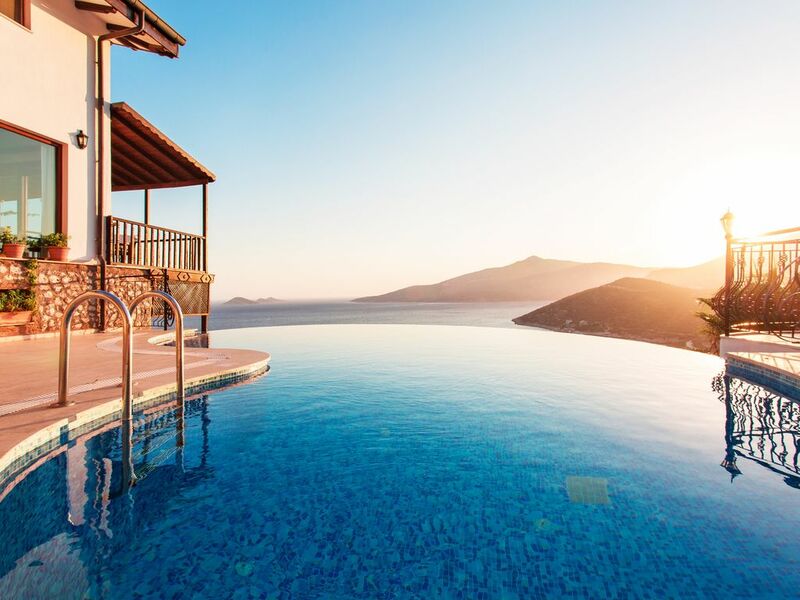 We have been privileged to holiday all over the world but the view of Kalkan Bay from every room and especially the outdoor areas including the pool, is absolutely breathtaking and extremely hard to beat. A fantastic villa designed by Abdullah who we had the pleasure to meet along with his charming wife, we got the feeling that they really want you to enjoy your break and have provided the perfect villa , stunning views with a villa that has style and substance in spades! You should definitely give it a try, the best villa in Kalkan and I'm sure that you would agreement ! Stayed in the villa for two weeks from the 22nd August and had a great relaxing time. The villa has everything needed, including darts and table tennis as well as the fantastic view. Even the taxi drivers commented that this villa has the best view in Kalkan. Around 20 minutes downhill walk to town, but 15lira each way in a taxi is easier ! Kalkan has lots of very good restaurants and the quality of the food is great everywhere. The harbour offers trips all around so this is a good base for a holiday. Abdullah very helpful and easy to deal with, arranging airport transfers and the welcome pack (as well as fresh bread every day). If you want a villa where the views are amazing, where you can watch turtles from the balcony in the morning and spot mountain goats on the hills in the afternoon, with easy access to Kalkan then this villa is highly recommended. Change over day is Saturday All linen, towels and beach towels are provided. Linen and towels are changed two times a week. Maid service is available two times a week. The price includes this service. A welcome pack of fresh produce is included free of charge. The air-conditioning is hot and cold. Cots, high chairs are available if required.